With everything that went wrong on the Virginia Tech sideline Thursday night, the Hokies still managed to keep one positive record afloat. A late touchdown pass from backup Hokies quarterback Mark Leal to Isaiah Ford gave Virginia Tech their first points of the night. Unfortunately for them, the Miami Hurricanes had already put up 30 on the scoreboard. When it was all over, the Lane Stadium scoreboard read, in front of a sparse late-game crowd, Miami 30, Virginia Tech 6. The Hokies avoided their first shutout since 1995, a 16-0 loss to Cincinnati. For Duke Johnson, it was a day he’ll never forget in a Canes uniform. He rushed for a career-high 249 yards, rushed and received for a touchdown, becoming the first Football Bowl Subdivision player since 2010 to do so. The Miami offense looked more like the triple-option Georgia Tech offense. Brad Kaaya only connected on 7 of 16 pass attempts. Duke Johnson led the team in receiving yards with 37. The game started as a first quarter defensive battle, with only a Michael Badgley 28-yard field goal standing between the teams. Then Miami recorded the play that started the never-ending party in Blacksburg. On third and 8 from their own 23-yard line, Kaaya faded back to throw. Just before he was sacked, Kaaya aired the ball out toward Duke Johnson, who laid out for an incredible first-down catch at the Miami 38. The drive would lead to a Gus Edwards goal-line touchdown. Everything went Miami’s way on Thursday. Offense was great, and defense only allowed 120 rushing yards on the road. Even special teams leaned in Miami’s favor, specifically one punt from Virginia Tech’s one-yard line that took a Miami bounce and started the Canes at the Tech 24. Duke Johnson would then rush those 24 yards to put the Canes up 17-0. It was a crucial Miami victory in an ever-tightening ACC Coastal; the win gives them their first winning streak in over a month since wins over Florida A&M and Arkansas State at home. Miami forges ahead at 5-3 (2-2 ACC) and Virginia Tech slides down to 4-4 (1-3 ACC). 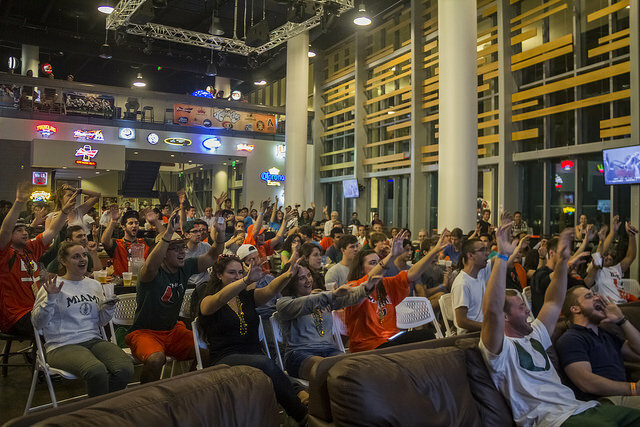 The Canes have their Homecoming Game next Saturday against the North Carolina Tar Heels. Kickoff is set for 12:30 p.m.